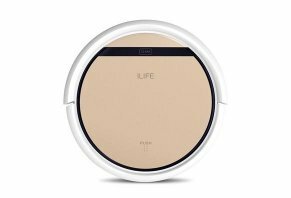 iLife V5s Reviews - Is It the Right Robotic Vacuum for You? Because it comes with a low-profile design that fits under most furniture, a rock-bottom price, and built-in features like scheduling and four cleaning modes, the iLife V5s robotic vacuum ranked as our #3 top budget model. 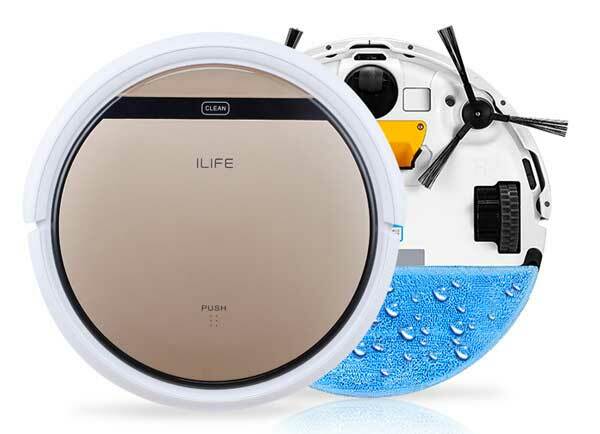 iLife V5s robotic vacuum cleaner offers many essential features—including a full suite of sensors to help navigate its environment, the ability to clean hard flooring and thin carpeting, and convenient scheduling—at an ultra-affordable price. The robotic vacuum can also comfortably fit under most furniture and comes with improved quality, boosted cleaning strength, and longer battery life than its predecessor. It has three built-in cleaning functions (auto, spot, and edge), along with a remote control. Based on its high marks from professionals and customers alike, iLife’s V5s earned the third place among budget models in our Robotic Vacuum Cleaner Buyers Guide. But, does this necessarily mean it'll be a good fit for your household? Stick with us for a few minutes, and this is the primary question we'll focus on here. The iLife V5s is 11.8" in diameter, 2.75" high, and weighs about 4.5 lbs. It operates using a 2600 mAh Lithium-ion battery that delivers between 90 and 110 minutes of run time and will take roughly 280 minutes to recharge. On the vacuum’s top, you’ll find an IR signal receiver at the front that communicates with the charging dock when returning, LED indicators that display working status, a one-touch Auto Clean button, and a total of 10 sensors in the bumper to help it change direction when an object is detected and avoid a collision. There’s also a lid, which provides access to the 0.3L dustbin, as well as an on/off switch. On the vacuum's underside, the nose wheel allows it to quickly change direction while cleaning, with two no-wear brushes that extend the cleaning area and increase efficiency, along with the drop sensors that keep it from falling over edges. As the side brushes pick up dirt, it’s sucked through the intake and stored in the dirt bin. The V5s moves using two high-density wheels made of soft rubber, which protect floors and make climbing easy. As it moves, the dry nanofiber mop cloth helps pick up dust and smaller particles. Auto – The robot will adjust its cleaning according to the situation. Spot – Place the robot near a dirty area and press the Spot button on the remote control. After the robot is finished cleaning, it will return to your selected mode. Edge – Place the robot near a wall and then press the Edge button on the remote. It will continue cleaning in this mode until no more edges are detected, or until you instruct it to stop. You can pause cleaning or turn the V5s to Sleep mode at any time. There’s no app connectivity or other ‘smart’ functionality, although you can schedule it to perform future cleanings at specific times via the remote. The manual indicates cleaning is straightforward and simply involves wiping the side brushes with a cloth when they get dirty and replacing them when damaged. You’ll also need to empty the dustbin after each use and clean the sensors and charging pins with a soft, dry cloth. What’s the Difference Between the V5s and V5s Pro? How Much Does the iLife V5S Cost and Where Can You Buy? We found the iLife V5s and Pro models sold at retailers like Amazon, Newegg, and Walmart.com for between $159 and $199 at the time of our research. In addition to the robotic vacuum, each package included a self-charging base, remote control, adapter, two replacement brushes, one filter, one cleaning cloth, and one AAA battery. Replacement parts packages (brushes, filters, and microfiber cloths) were available through many of these same retailers starting at about $15. What Can We Learn from Customer Reviews for the iLife V5s? Pretty much wherever we turned, the iLife V5s came with mostly positive online customer feedback. For example, more than 1,400 Amazon customers had given the robotic vacuum an average rating of four stars at the time of our research, based on common compliments relating to its ease of use, effective cleaning, and competitive price. On the other hand, the relatively few complaints frequently revolved around less-than-stellar functionality, along with quality concerns. As a company, iLife Innovation has been in business since 2007. They also manufacture other robotic vacuum models like the V8s, V7s Pro, V55, V3s Pro, and V50. Since the company is based out of Shenzhen, China, they weren’t listed with the Better Business Bureau. iLife V5s vs. Other Robotic Vacuums: How Can You Choose? From models that cost less than $100 to those nearing the $1,000 mark, there are dozens of robotic vacuum models you can potentially choose from, including popular base models competing for many of the same customers as the V5s, like the DIGIPRO, Hoover Quest, iLife A4S, and Eufy Robovac 11, to name just a few. What’s the best way to go about determining which model is best for you? You’ll want to start by maintaining realistic expectations. In other words, keep in mind that robotic vacuums are only designed to pick up light surface debris—they’re not built to replace the more intensive cleaning provided by standard upright or canister vacuums. Given all of these criteria, should you go ahead and place an order for the iLife V5s? While we didn’t test any models firsthand, at between $159 and $199, the iLife V5s seems to deliver a ton a useful features—including dual front brushes, four different cleaning modes, between 90 and 110 minutes of run time, scheduling, and the ability to clean hard flooring and thin carpeting—at an ultra-competitive price. It’s also the only model at this price point that offers dry mopping functionality (and wet mopping with the Pro version). And at 2.75” in height, it’s one of the thinnest available, should you have especially low-slung furniture in your home. And this is to say nothing of its overwhelmingly positive online customer reputation on sites like Amazon and Walmart.com. These are some of the main reasons the V5s ranked at number three in Top Budget Models in our Robotic Vacuum Cleaner Buying Guide. Just keep in mind that at this price point, you won’t get additional technology features like app connectivity (and many of the related data points, like mapping, that come along with it), or complex visual algorithms that map rooms to ensure optimal cleaning each and every time. Write a Review for iLife V5s!